Welcome to Corny Cones: The FIRST company to make and produce the now famous J Shaped Korean Ice Cream Cone, right here in Hawaii. 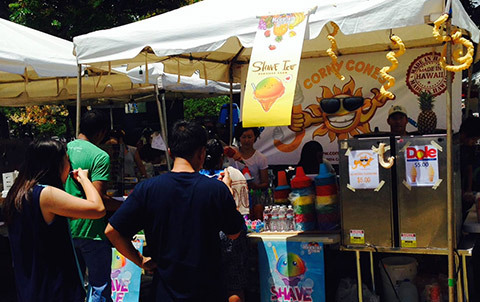 Our production facility located in Kaka'ako produces the yummiest, crunchiest and freshest cones. The best part is our cones are All Natural and 100% Gluten Free. The result is a delicious crunchy corn snack in the shape of a “J” with a hollow center filled with Dairy Free Ice Cream.This makes for a unique, refreshing and delicious ice cream experience that won't melt in your hand and is tastier than traditional cones. We offer a delicious Hawaiian made Vanilla flavor, and we also serve the famous Dole Pineapple Soft Serve, or you can even mix them together. Visit our News & Events page for past events and also a view our upcoming events of where we will be located and servicing our fresh and delicious summer treat. For existing restaurants, food trucks, ice cream stores or any other business looking to purchase our cones, please visit our Hawaii Wholesale J Shaped Cone Page and simply fill out our online Wholesale Request form. We will return your request immediately. We offer bulk pricing, ice cream machine sales and leasing, cone nozzle fabrication and even training on how to best fill the cone. 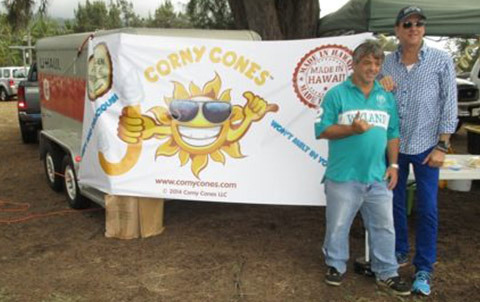 For general inquires, visit our Contact Page, call us at 808-224-8816 or email info@cornycones.com. Mahalo from the first and the best producers of this delicious new treat in Hawaii! We are selling the cones wholesale to any business interested in serving the cone. Corny Cones provides nozzle manufacturing for ice cream machines so you can fill these delicious cones! We can also provide the soft serve as well as the Dole Pineapple Soft Serve, sold by the case. 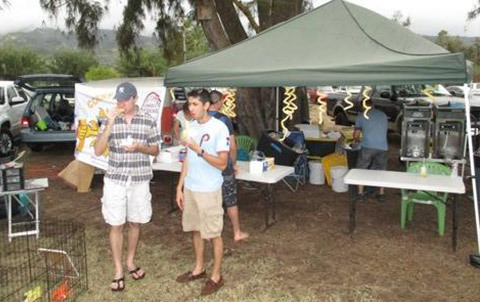 Corny Cones is proud to take part in community events and spread the love that is delicious corn based ice cream cones. Made in Hawaii by local workers, the flavor and ingenuity of the Korean j shaped ice cream cone has comes to the islands and is available to all. People of all ages will agree that the taste of corny cones can't be beat! 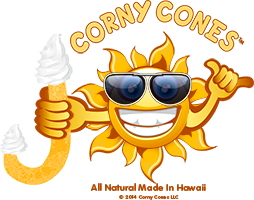 The functionality of the cones allows for ice cream to collect in the J portion of the corn-based cone, minimizing spillage as you enjoy a cool treat under the hot island sun. 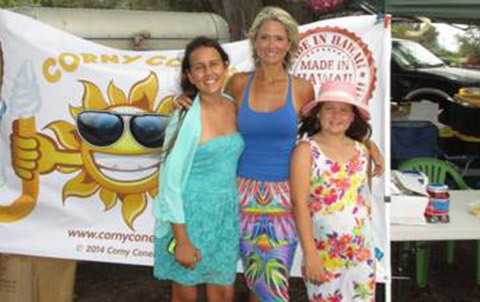 Corny cones takes part in local events and also has placed their products up for wholesale to local venders. Please visit our Wholesale page for more information on how you can get this wonderful treat out to your cherished customers. 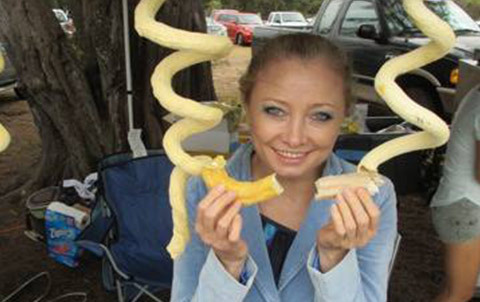 "It really helps my gluten-free diet when I can enjoy foods that have starch-like elements. 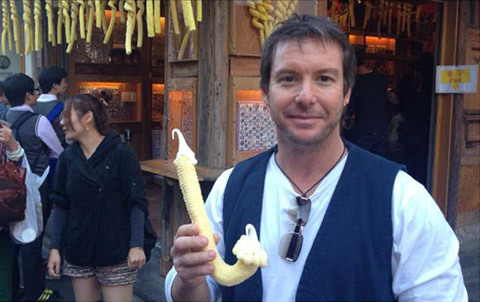 The fact that the corny cones make ice cream taste amazing is a big plus as well." "I'm surprised by how fresh the cones taste, even after hanging up on display. These corn-based cones never get stale and never get soggy, even in the face of ice cream in warm hands." "These cones are simply delicious and after eating one I can't imagine ice cream without them!" "Ice cream has never tasted better in Hawaii!"